Each spring, mallard ducks return to Union Square. The male calls and female quacks echo across the rippling water and bounce off the stately statue of General Ulysses S. Grant. Families, some waiting to enter the Botanic Garden, others out for an evening stroll, watch the majestic ducks swim across the Capitol Reflecting Pool. The ducks have made the pool their home – an oasis in the urban jungle of Washington, D.C.— and as the temperatures rise in the region, newly-hatched ducklings will join the fray. The Capitol Reflecting Pool was designed to serve as a counterpoint to the one at the western end of the National Mall, between the Lincoln Memorial and Washington Monument. Since its completion, the Capitol Reflecting Pool has been a popular attraction – for ducks and humans! The broad gently sloped limestone coping of the pool, however, has an unintended side-effect for our feathered-friends. Some ducklings have trouble climbing out of the pool or returning to it once out of the water. The Architect of the Capitol (AOC) collaborated with City Wildlife, a not-for-profit organization dedicated to rescuing and rehabilitating sick, orphaned and injured wild animals in Washington, D.C., to help the Capitol Hill ducklings. Nancy Skinkle, a director in AOC's Planning and Project Management Division (PPM), and Ted Bechtol, Superintendent of Capitol Grounds, worked with Anne Lewis, President of City Wildlife, to understand the needs of ducklings, provide design guidelines and research options available to address the problem. 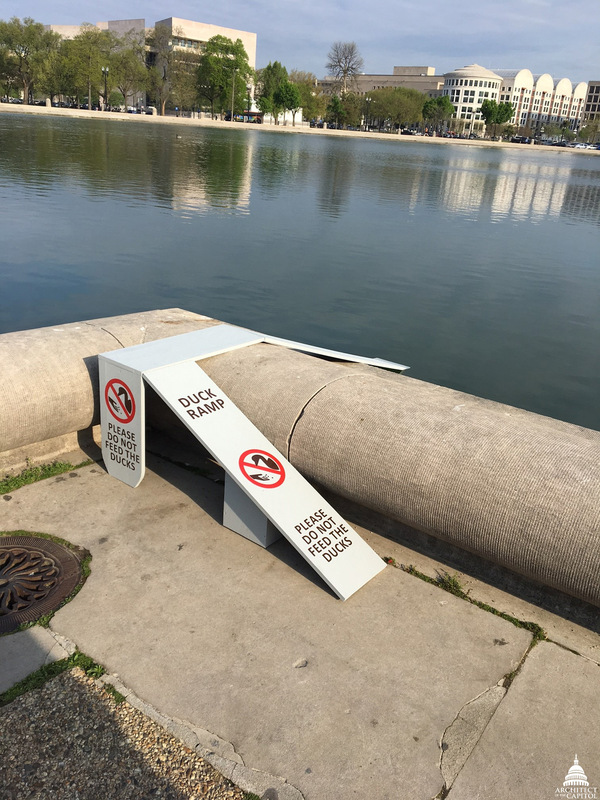 One of the ramps at the Capitol Reflecting Pool installed to safely and effectively assist ducks in and out of the water. "After consultation with City Wildlife, we held a design charrette to determine the best ramp design to allow ducks of all ages to enter and exit the pool easily over the existing limestone curb. I'm proud of the AOC team's enthusiasm for solving this challenge. Tim Reed, an agency architect, quickly drew a feasible design based on the reflecting pool's measurements," said Skinkle. According to Lewis, "The ducks have an uncanny ability to locate a way out of the water, if one is provided. We can never truly predict their behavior, but our goal is to provide them the means to get in and out of the water, which is what they need to do in the wild to protect their duckling from becoming waterlogged or cold. The rest is up to them, but they do have a strong survival instinct especially when there are ducklings involved." With the PPM design in hand, M. Lee Dennis, Maintenance Mechanic Supervisor for Capitol Grounds began building two ramps for the Capitol Reflecting Pool. Today, they are installed to safely and effectively assist ducks in and out of the water. Four broods, or families of Mallard ducks, currently call the Capitol Reflecting Pool home. The pool serves as a wildlife corridor, linking two or more areas of similar wildlife habitat. Migrating Mallards use the area as a stopover point in the spring and fall. Corridors are critical links allowing the movement of animals and the continuation of viable populations. The Capitol Reflecting Pool is located at the eastern end of the National Mall in Washington, D.C. Six acres in size, it occupies over half of the area called Union Square. It is set into a plaza that includes, on the east, the Ulysses S. Grant memorial; to its west is a tree-dotted grassy area that extends to Third Streets, NW and SW. Nearby tourist destinations include the United States Capitol, the U.S. Botanic Garden, and the museums and galleries along the Mall. Follow @uscapitol and #districtducklings on Twitter or Instagram for more. Neat article. The duck ramps are interesting. Thanks, Erin. Dear Humanitarian, thank YOU for the wonderful ramp. For the momma and her baby ducks. Praying for a more humane world of humans! Awww. This was a very kind act. Great job! I'm writing to say that I think the duck ramps are fantastic and so glad that you're looking out for the ducks. I'm sincerely happy to see my tax dollars being spent on a project that takes care of the wildlife around the capitol and fully support more projects like duck ramps! How wonderful! As the title of the children's book states... you built ramps to : Make Way for Ducklings! a wonderful rest from politics! Make way for Ducklings!!! Erin, thank you and everyone involved in this worthwhile and life-affirming project. You have demonstrated the heart and soul that too often is missing in D.C. You made my day. Thank you for taking the time to do this! I've seen similar ones (but not quite as nice) in some parks in London. It is refreshing to see some compassion at work. While we live in NC, if you decide to take up donations for more ramps please contact us, I'll be happy to help out the ducklings. I hope you share the plans with other muni's that have similar situations. What a wonderful use of tax dollars, and what a clever solution to this problem. This was delightful to read.